A chain-link fence in Leesbug, VA can do many different jobs in a variety of fencing applications that require security, safety and transparency. Also called wire-mesh, diamond-mesh, cyclone or hurricane fencing, the first U.S. patent on the equipment used to manufacture chain-link is owned by Anchor Fence, founded in 1898. But it wasn’t until 60 years later, in 1958, that the patent for chain link fencing was awarded to inventor Joseph V. Morrissey and the U.S. Steel Corporation. 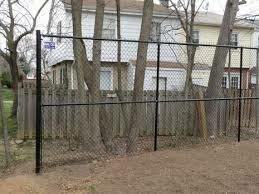 Provide whole property perimeter security. Secure a specific internal or external space for a dedicated purpose. Create a secure and visible place for your pets or children to play safely. 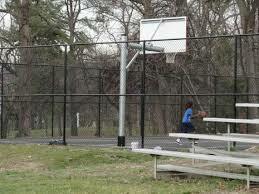 Enclose an area or item, like a swimming pool, tennis or basketball courts, or a baseball field, for safety with a view. Or, enclose an area or item, like outdoor HVAC equipment or your back property line, with a slat chain-link fence in Leesburg, VA for more visual appeal and heightened privacy. 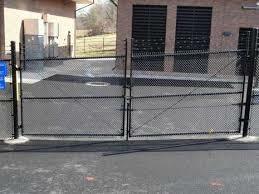 A secure chain-link fence in Leesburg, VA is woven from galvanized or coated steel wire. There are three standard types: Untreated galvanized steel wire is the least expensive; slat chain link fencing with inserts interwoven; or PVC-coated chain link fencing with a heat-bonded vinyl coating barrier against rust, which is the most expensive standard chain link fencing on the market. Chain link fences in Leesbug, VA are available in a full spectrum of colors, with a variety of interesting, beautiful, and practical optional features that can enhance the performance and curb appeal and performance of any chain-link fence in Leesburg, VA.
As with any home improvement, proper installation is critical to the life and performance of your chain-link fence investment. The professional fence contractors at Hal Co have spent the past quarter century installing and maintaining attractive, long-life fencing for residential and commercial clients throughout Northern Virginia. Contact Hal Co today to put our knowledge and talents to work at your Leesburg home, business, or recreation area. We’ll install a practical, low-cost, high-quality chain-link fence in Leesburg, VA to protect what’s important to you and provide you with the safety and security you need. This entry was posted on Friday, May 16th, 2014 at 3:30 pm	and is filed under chain link fence, commercial fencing, Fences. You can follow any responses to this entry through the RSS 2.0 feed. Both comments and pings are currently closed.